An afternoon at Shoreline looks like something straight out of a Georges Seurat painting. Families and couples relax on the grass field feet from the lake as thrill-seekers try their hand at windsurfing or sailing. It might as well be “A Sunday Afternoon on the Island of La Grande Jatte,” but this idyllic scene is really just a stop off the Caltrain in Mountain View. 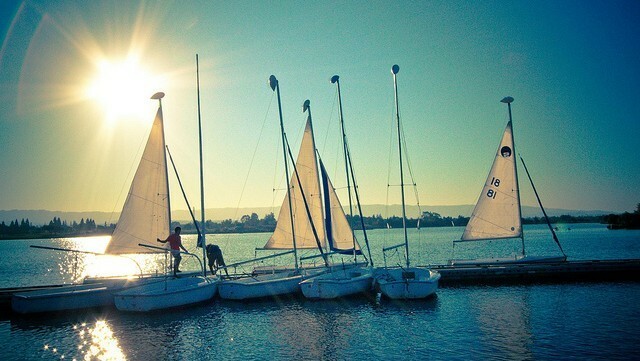 Beginners flock to Shoreline Lake for its calm waters and consistent winds, which are relatively light in the morning (5 to 8 knots) and gradually pick up speed in the late afternoon (15 to 18 knots). An entirely man made lake, Shoreline is a great place for beginners to build confidence windsurfing or sailing before taking to the Bay. The Shoreline Aquatic Center rents paddleboats, canoes, kayaks, rowboats, windsurfing gear, and sailboats on an hourly basis. You can also launch your own vessel for a launch fee of $6 for sailboats and $5 for any other type of boat. Those looking for a little extra instruction can take advantage of Shoreline’s private lessons year-round and group lessons from February through October. Seafaring kids (ages 5 to 15) can also participate in Shoreline’s Windsurfing and Sailing Camps. The paved, flat Shoreline trails are perfect for families juggling strollers and young children as well as for bikers stretching out their legs on a lunch break. Walkers and cyclists have the option to go off the main trail that circles Shoreline Lake and head towards the Bay, where cool winds keep this sunny trail very tolerable. The natural landscape along the Bay is home to numerous birds and animals, including rare sightings such as burrowing owls and jackrabbits. All that sailing and cycling can really work up an appetite, so be sure to stop at Shoreline’s Lakeside Café. Lounge by the water on the outdoor patio with a Crissy sandwich ($8.25), Stella ($4.50/pint) and views of windsurfers and sailors. Built in 1867, the Rengstorff House is Mountain View’s oldest historic house. Henry Rengstorff was a German immigrant who came to California in 1850 for the Gold Rush, but instead worked as a bay steamer and later as a farm laborer. In 1959, Rengstorff’s descendents sold the house to the Newhall Development Company and by 1979 the house had been abandoned and vandalized by trespassers. The City of Mountain View purchased the house for $1 and moved it to Shoreline. Today, the Rengstorff House has gone through a $1.5 million renovation and is open as a free museum on Sunday, Tuesday, and Wednesday with guided tours led by docents dressed in period costume from 11 a.m. to 5 p.m. If you plan ahead, consider coordinating your trip to Shoreline with one of your favorite artist’s concert at the Shoreline Amphitheatre. The outdoor amphitheater holds 22,000 seats and upcoming shows vary from festivals like Harmony by the Bay to concerts featuring Florence and the Machine, Dave Matthews Band, and Linkin Park. Take Caltrain to the San Antonio Caltrain Station. From there, take Bus 40 towards La Avenida & Shoreline.